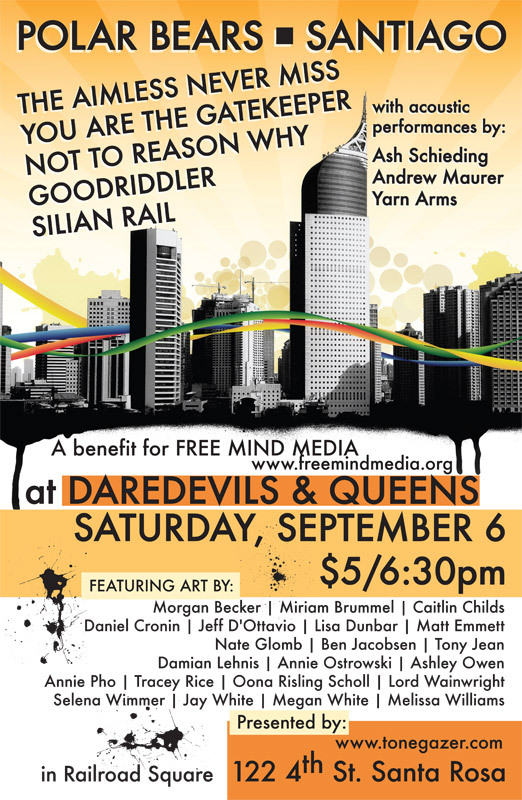 The Bunker, Goodriddler, Santiago, and DJ Broken Record played a benefit show for Free Mind Media on Saturday. The event was at Monroe Hall, this crazy old hall on West College avenue filled with tons of Americana and taxidermied animals. The benefit show for Free Mind Media was fantastic and I had a great time hanging out with so many awesome people. There were about a million bands and artists and we raised over 2 months of expenses for Free Mind in one night. I was honestly overwhelmed at the support and can’t wait for the next event Terrence and the folks at Tonegazer put on. I took a whole bunch of photos. I was mostly experimenting with my portrait lens and shooting without a flash, so some of them came out sharper than others. The lighting inside Daredevils & Queens was fantastic though (they are seriously the coolest hair salon ever) and I ended up liking the effect. I just finished the design on the poster for the September 6th Polar Bears/Santiago show at Daredevils and Queens in Santa Rosa. I’m showing some art at the event too. Pretty exciting! Featuring the Polar Bears, Santiago, + more bands and a billion awesome artists!